Probably the best-known historic building associated with African Americans in Indianapolis, the Madame C. J. Walker Building is nationally significant as home to one of the earliest, and for years the most successful, black business empire in the United States. 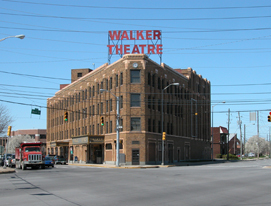 The Walker Building illustrates Madame Walker's commitment to the employment of black women and her promotion of arts in the black community. 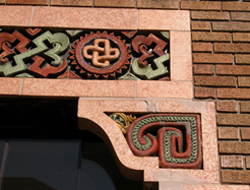 Its terra cotta architectural detailing is rare for its use of African art motifs and imagery. The building is located in the vibrant Indiana Avenue corridor, which was the home of businesses, jazz clubs, and churches of the black community. Born Sarah Breedlove in the Louisiana Delta in 1867, Walker acquired her name from her husband Charles Walker, whom she married while living in Denver. Madame Walker had by that time invented a hair treatment for black women and began mail distribution of the product. The Walker System of products grew from the original treatment of shampoo, the Wonderful Hair Grower, and a special patented comb, to include facials, manicures, make-up application, and diet and weight control advice. Madame Walker's beauty business helped black women enhance their appearance and created job opportunities for them as hairdressers and sales agents, known as "Walker Agents." While traveling, Madame Walker passed through Indianapolis, was impressed with the city, and relocated her business here in 1910. Walker soon became a millionaire and lived on and off at her palatial house just outside of New York City. In 1919, she died, leaving daughter A'Lelia in charge of the firm. By 1927, sales had grown to such an extent that A'Lelia planned a new headquarters. The company hired one of the best-known firms in Indianapolis, Rubush & Hunter, to design the multi-storied, tan brick "flatiron" shaped building. At one time, Indianapolis had a number of "flatirons," thanks to the radiating diagonal streets. The 1927 Walker Building is among the best examples left. The building became the national headquarters and manufacturing site for the products, where some 3,000 women worked, and also a community cultural center housing the factory, a ballroom, a theater, hair salon, corporate offices, and more. In keeping with the Walker Building's role as center of a unique business empire, the company's leaders called for a fitting building. The brick exterior is trimmed in richly ornamented architectural terra cotta. The overall feeling is Art Deco, but on closer inspection, Yoruba-like masks, zig-zags, and other ornament were inspired by African art. The interior continues the African theme with "Deco-ized" Egyptian and Moorish plaster work in the magnificent Art Deco theater. The theater space served not only as a movie house, but also as a showcase for live jazz. The Indiana Avenue area was rife with live jazz venues. Now the Walker is the only building left to recall this significant chapter of local cultural history. The Madame C.J. Walker Building is located at 617 Indiana Ave. It has been designated a National Historic Landmark. Click here for the National Historic Landmark registration file. Guided tours are available for groups of 10 or more. Call 317-236-2099 for tour reservations. Cost will vary. For more information contact the tour office or Madame Walker Theatre Center. INDYGO bus line from downtown: #34 Michigan Rd., disembark at West and Indiana. The Madame C.J. Walker Building is the subject of an online lesson plan, Two American Entrepreneurs: Madam C. J. Walker and J. C. Penney. The lesson plan has been produced by the National Park Service’s Teaching with Historic Places program, which offers a series of online classroom-ready lesson plans on registered historic places. To learn more, visit the Teaching with Historic Places home page.